We have stayed in a good number of hotels in Athens but this is the best, The staff are courtious, knowledgable and helpful. The rooms are wonderful, plenty of everything, if you are self catering, if not the breakfasts are good too, if you get a front room you have a view of the Acropolis. We booked a suite for our stay last year, 2 double beds, small lounge, well equipt kitchenette and a large balcony. 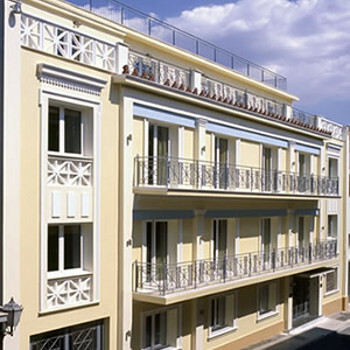 The location is perfect, just on the edge of the Plaka, short walk to all the tourist sites, Parthanon, Zappion, National Gardens, Old Olympic Stadium, Syntagma Square, Parliament, The Efzones (Guardsmen) change every hour, near to the shopping areas as well Ermou and Athenas streets 10 minutes walk. We love this hotel and would not stay anywhere else.